The fifteenth What’s Out There Weekend—and the fourth in 2015—saw almost 1,000 people register for free, expert-led tours of Austin, Texas. More than two dozen tours provided opportunities for attendees to explore 29 distinct sites that comprise just some of Austin’s 18,000 acres of public parks and open spaces. 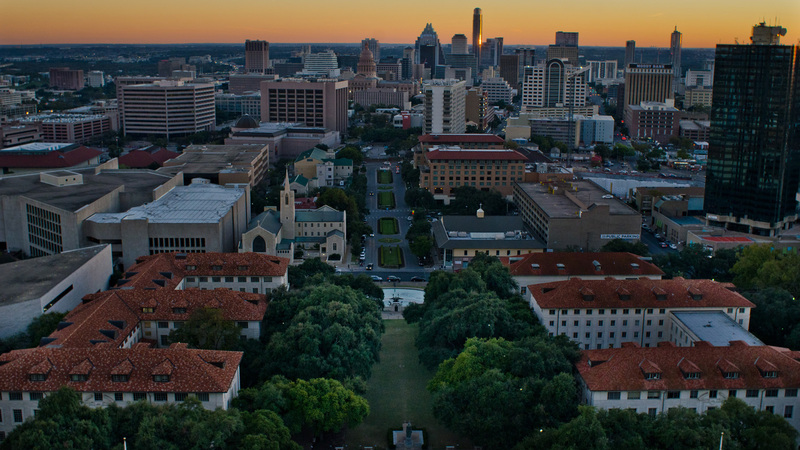 The Austin American-Stateman's Michael Barnes provided an excellent preview to the Weekend in an illuminating interview with landscape architect Eleanor McKinney. The event kicked-off with a launch reception at Scholz Garten, a popular gathering spot that has served Austin since 1866 and was listed on the National Register of Historic Places in 1979. 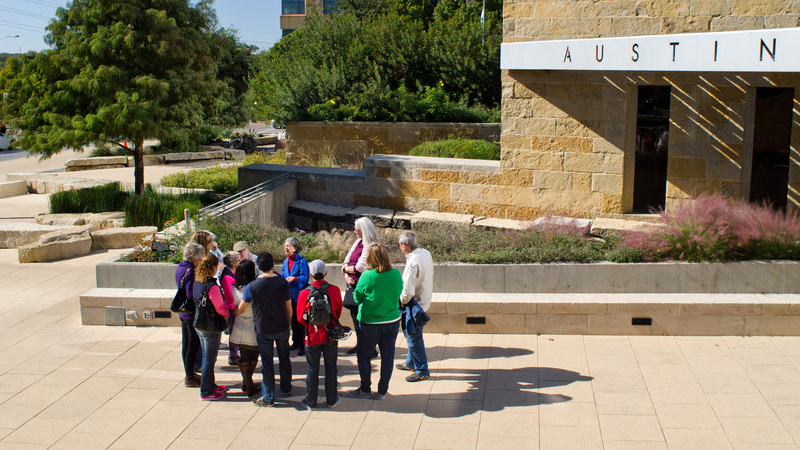 Hosted by the Central Texas Chapter of the American Society of Landscape Architects, the event allowed tour guides, volunteers, and project partners to connect with one another and discuss the upcoming tours. Council Member Sabino “Pio” Renteria (District 3) was in attendance, as was Kim McKnight, preservation planner and cultural resource specialist with Austin’s Parks and Recreation Department. Saturday’s tours commenced in the wake of a cold front that brought rain and blustery conditions, but by 11a.m. the sun was shining and the skies had cleared. A well-attended tour of the Zilker Botanic Garden was led by Elizabeth McVeety, the garden center coordinator; Paula Jarrett Nasta, a graduate student in historic preservation at the University of Texas’ School of Architecture; and Barbara Pate, a docent at the site. Later, Clark Hancock, the exhibit and collections coordinator at the Austin Nature & Science Center, led an excursion to Zilker Metropolitan Park and Barton Springs, two of Austin’s oldest and most beloved public parks. Across town, Kevin Anderson, Ph.D., presented an illustrated overview of Texas’ cultural landscapes and described the importance of stewardship as part of his tour of the Austin Water Center for Environmental Research at Hornsby Bend. Back downtown, at Wooldridge Square, Charles Peveto and Mitchell McGovern discussed the complexities of maintaining the historic character of the site and stressed the importance of public engagement and coalition building. Sara Hensley, director of Austin’s Parks and Recreation Department, was in attendance and talked about the recent rejuvenation of site, thanking Peveto and McGovern for the ongoing work of the Friends of Wooldridge Square. 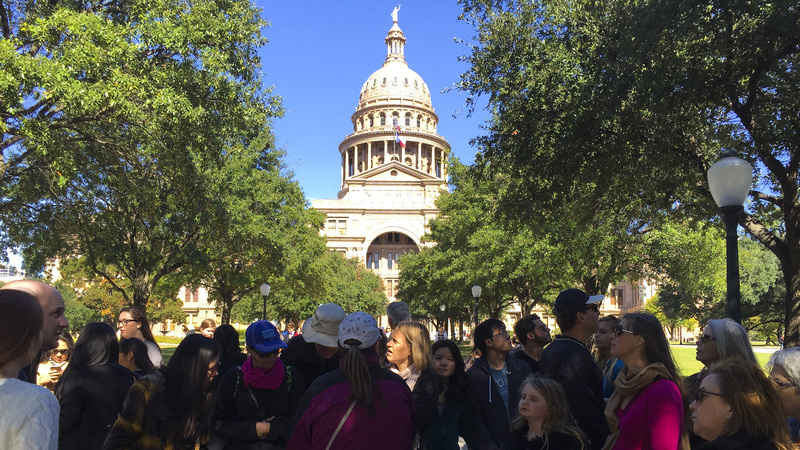 Nearby, a large group convened for a tour of the 22-acre Texas Capitol Grounds, led by Ali James, the Texas State Preservation Board’s curator of the capitol. James discussed the site’s extensive plantings, which were developed between the 1880s and the early 1900s by William Johnson and Charles Gilbert. Attendees were then treated to a special tour of the Texas Governor’s Mansion, a landscape normally closed to the public but made available for What’s Out There Weekend. On Saturday afternoon, an excursion to the ten-mile-long Ann and Roy Butler Hike and Bike Trail was led by Susan Plettman Rankin, executive director of The Trail Foundation, and Albert Godfrey, principal of Limbacher & Godfrey Architects. Richard Craig joined Peveto and McGovern in leading a tour of Pease District Park, Austin’s first public open space, donated to the City in 1875. Landscape architects Eleanor McKinney and Carolyn Kelley discussed their design for the green roof and public plaza at Austin’s City Hall, a design that draws inspiration from Texas’ diverse ecosystems. A tour of the Italianate Laguna Gloria was led by Catherine O'Connor, principal of Co'Design; Mirka Benes, associate professor at the University of Texas at Austin; and Emily Cayton, associate educator for teachers and docents, The Contemporary Austin. O’Connor and Benes also led a tour of neighboring Mayfield Park and Preserve. Gloria Pennington, president of Austin Friends of Folk Art led a group through Parque Zaragoza, established in 1931, and Dr. Fred McGhee discussed the role that Rosewood Park has played in Austin’s African American history and culture. 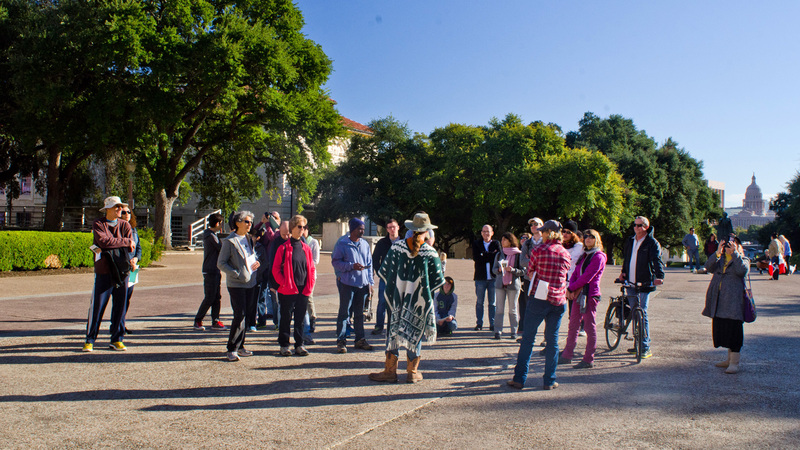 At Hyde Park, Lin Team and Ann Graham led a 1.5-mile walking tour, and Paul Cato joined the group to talk about the history of the grounds of the Austin State Hospital. Landscape architect Christine Ten Eyck was joined by architectural historian John Volz in a discussion about the ongoing transformation of the Commodore Perry Estate. The last tour of the day explored Waller Creek, led by Daniel Woodroffe, principal at DWG, and John Rigdon, director of planning and design at the Waller Creek Conservancy. The duo talked about the engineering feats of constructing a tunnel beneath the creek to minimize the risk of flooding and maintain a healthy riparian ecosystem, as well as their work in changing public perceptions of the creek, and the eventual recreational opportunities that are part of their plans for this “green spine” running through Austin. 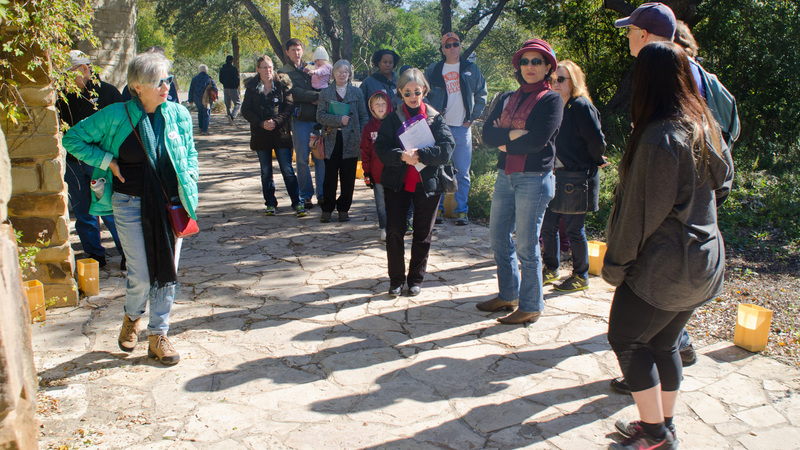 The tour ended at Creek Show, an annual event that features art installations along Waller Creek designed to educate (and entertain) people about the importance of stewardship of this resource. Sunday began with a tour of the vibrant South Congress Avenue, led by Emily Little, principal of Architects Clayton & Little, and Jana McCann, principal of McCann Adams. Nearby, Dale Flatt, president of Save Austin’s Cemeteries, and Kate Singleton, executive director of Preservation Austin, discussed the complex process of maintaining Oakwood Cemetery as both a historic site and a public open space. With more than 23,000 burials (many of which are unmarked), some dating back to 1839, Flatt talked about a new master plan for the cemetery that will help manage “the only piece of property you buy once, but are expected to care for forever.” At McKinney Falls State Park, Jenn Menge and Michael Strutt, Ph.D., led a group along trails that provided views of the confluence of Onion and Williamson Creeks, as well as archaeological remains and one of the oldest bald cypress trees in Texas. At the Lady Bird Johnson Wildflower Center, Andrea DeLong-Amaya, the director of horticulture, joined Eleanor McKinney, one of the original designers of the site, for a tour of this research facility and botanical garden. She talked about camping at the site with other designers before creating their master plan, and pointed to features of the designed landscape that were inspired by natural qualities. The What’s Out There Weekend program dovetails with TCLF’s What’s Out There database, comprising more than 1,900 landscapes, 900 designer profiles, and 10,000 images. The Weekends enable people to discover the design history of places they may pass every day but know little about, and to learn about the people who designed them. What’s Out There Austin was made possible by the National Endowment for the Arts Art Works program and through support provided by Bartlett Tree Experts, Design Workshop, and Preservation Austin.